My name is Adam Pryor. I graduated in the Fall of 2014. The first time I visited UNC Asheville’s campus I knew the first place I wanted to see was the music hall. Lipinsky hall, with its unique architecture, immediately told me that something interesting lay within. Down in the basement was where all the magic happened; 3 separate studios each with their own type of functionality with loads of nice toys and gear to play with. The main studio was comprised of 2 isolation rooms and the main control room with vintage mics, tape machines, high end mixing console, and vintage outboard processing gear with a patch bay for easy routing. Next door was the mixing and mastering room, acoustically treated, with surround sound capability, and loads of mixing software. The final studio was where my dreams were fully “synthesized.” Dr. Robert Moog was a professor for some time at UNC Asheville after moving to the area to build his synthesizer company, Moog Music, back up. After his death, the university commemorated his legacy by opening the Bob Moog Electronic Music Studio.Inside this studio housed several (understatement) Moog synthesizers and various other Moog electronic effects and processors. I had always been interested in electronic music, but at the time where I was from no one listened to electronic music and talking about synthesizers was like speaking a foreign language. I didn’t care about its popularity or what I could potentially do with these instruments, I just knew I wanted to be there, to experience what those machines had to say and offer. I hadn’t even been accepted yet and I was already making connections. Getting accepted meant becoming determined, I had 4 years to figure out what I would do with my degree and how it could be something I knew I loved doing. Failure was not an option for me personally for there was nothing back home for me to make a living at or any other thing that gave me such impetus as these electronic instruments did. I went to class, took in as much as I could, and most importantly, I had discussions with my professors and peers to help me decide what path was right for me after graduating from college. I discovered Moog Music was operating out of Asheville and was opening a new production facility close to downtown. Even better, I came across a company in very close proximity called Make Noise, who made modular synthesizers. Here were my opportunities to make something of myself. I immediately started building a connection with the staff at Make Noise. That connection gave me the opportunity to land a summer internship with the company. Around this time I started to become more fascinated with electronics. These synthesizers were spurring my further curiosity into the science behind the machines. Jude Weinberg, who I was fortunate enough and privileged to have as a professor was just the mentor I needed. He helped to broaden my interests and understanding of electronics, synthesis, and the physics of sound. He helped keep me motivated and would help whenever I couldn’t quite grasp a concept. He even gave me a temporary job in the music department helping maintenance old equipment and digitally archive music on outdated playback formats (reel to reel, ADAT, etc.). Professor Weinberg encouraged me to reach out to Make Noise and eventually would help lead me to my ultimate end-of-college goal, land a job at Moog. 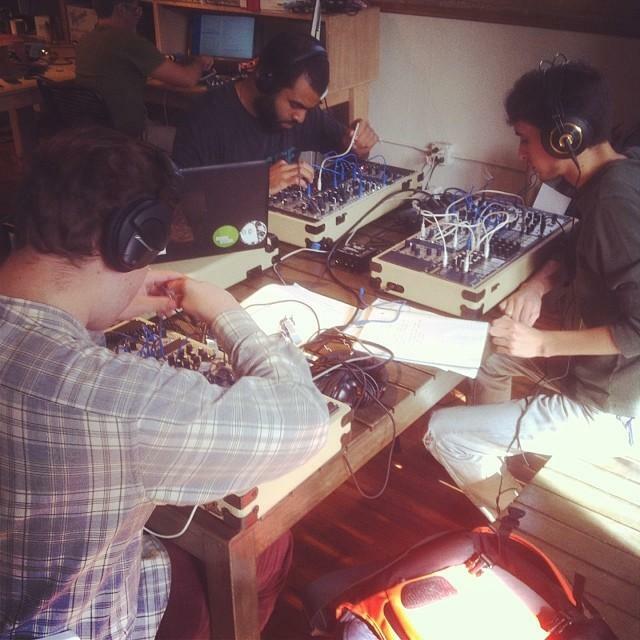 This picture was taken one afternoon when we were given free time to patch and experience the modular synthesizers made by Make Noise. From left to right: Asher Hill, Matt Sherwood (in the back), Safarii Urena, and me. I knew I was taking a big step, a step towards the beginnings of a career in a field of work that I had since only dreamed of. I immediately made an appointment with Chris Hegg at the UNC Asheville Career Center. He was tremendously helpful with tuning up my resume, getting a cover letter written up, how to approach an interview, and even how to present myself as a professional on social media. He basically helped me find the right way to represent myself, bringing out my “A-game” so to say. Professor Weinberg put me in contact with Dean Cavanaugh, productions manager with Moog Music. All that was left to do was put myself out there and hope for the best. I emailed Mr. Cavanaugh with a copy of my resume and cover letter attached and then waited. At least a month went by without hearing anything, but then one day I receive an email back telling me that a position is open and that they would like me to come in for an interview. By this point, I was ecstatic and a little anxious. Regardless of getting a job, I knew to make it this far was an accomplishment. I went to the interview confident in myself. Again, I held on to the belief that I had made it this far and I wasn’t backing down now. The interview went very well, my relationship with the music department, my internship with Make Noise, and my experience with building electronics scored well with Mr. Cavanaugh. I presented myself as professional with my resume and cover letter. I wanted Moog to know that even though I was young and not even out of college yet, I was determined and reliable, that Moog was where I wanted to start my professional career. Several days passed when I received a phone call from Mr. Cavanaugh telling me that I landed the position. Instantly I felt this tremendous pressure lift off of me. I wasn’t sure if I was awake or dreaming. I had done what I set out to accomplish at the end of high school and through out college. What was even more incredible was that I hadn’t even graduated yet and they were already wanting me to start working. When my parents found out, they were so proud of me for sticking with my dream and working hard to graduate and land a job right out of college. Its an opportunity that doesn’t come along often for many college students these days. On my graduation day, I was able to hold my head high for I knew I had already accomplished so much, my degree was icing on the cake. 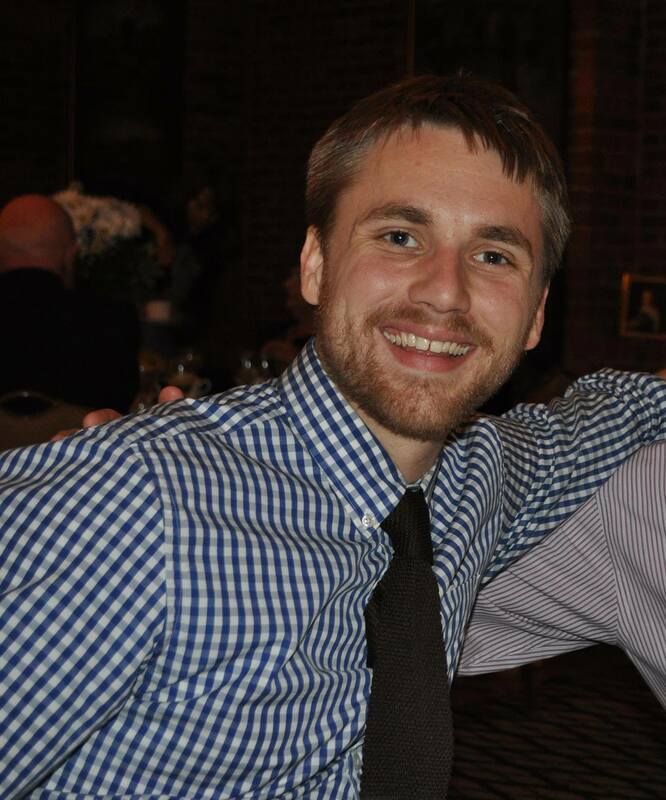 My name is Andrew Johnson and I am an Admissions Counselor for UNC Asheville.I graduated from UNC Asheville in December of 2010 with a degree in Music: General Performance and a Minor in Business/Marketing. I started at UNC Asheville with the intention of earning a degree in Psychology and then go to graduate school for something related because I figured I had to. I knew music would be part of my education, but when I dropped Psychology, I officially added Music. The old adage of “Do what you love” was the driving force behind my continuation of music with no other major track in mind; however, three semesters later “Bringing home the bacon” started to creep its way in. So then began my declaration of a marketing minor. As an Admissions Counselor, I frequently speak with parents who ask “What jobs are your alumni getting?” or “How many people are employed after they graduate with their degree?” I assure them that while I may be an Admissions Counselor, I still very much use my music degree. Furthermore, I also insist that even my marketing minor plays a big role in my current job. Marketing is a huge component of the Admissions process, so much that we borrow help from several departments on campus to help. My marketing education included an internship at a local WNC summer and retreat camp. My responsibility was to start an actual marketing strategy from scratch. I had to figure out what was important to say and show, how to present it, and who to present it to. As one can imagine, that is an important part of the Admissions recruitment process. In my international marketing course, one of my projects was to create a marketing plan to introduce an established candle product to Brazil. In Admissions, we are constantly seeing where we can expand in recruitment, and much like my project, I am looking at putting an established product in a new area, this time California and western Florida. Unfortunately, I am not able to put as much of my musical education into practice as an Admissions counselor as I would like! Be that as it may, I still find plenty of opportunities to make music. I have been involved with UNC Asheville Game Band since my sophomore year, and am now currently acting as the “Assistant Director”. 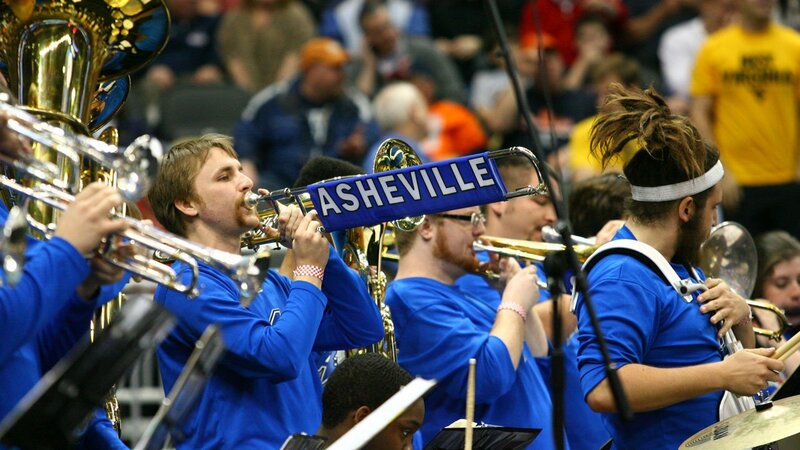 I love UNC Asheville basketball, and I love being able to support them by playing in the game band as well as arranging new songs for the band to play. I also perform with the Blue Ridge Orchestra which is a semi-professional orchestra for Western North Carolina. I have been recorded on two records with my band on piano and mandolin, and several other tracks for friend’s bands for trombone and mandolin. I do not want to say I will not consider music as a career because I cannot deny my future of something that I love to do! With that, I am continuing my education in graduate school at Western Carolina University with a Masters in College Student Personnel. My time working in higher education has pushed me to strongly considering it as a true career path, and hopefully my music background will be able to work hand in hand with it. Another question I am asked a lot, typically by parents, is “What is one thing you wish were/you did different at UNC Asheville.” As cliché as it sounds, I always answer with nothing. Of course there are some small things that I wish I did differently like maybe when an intramural sport rather than play 5 years with nothing to show for it. Overall though, everything I did put me where I am now. I have a job I love, recruiting for and admitting the best students for UNC Asheville. I am active in the community making and arranging music. It’s easy to enjoy your job when you love where you work, and your college years were raised in a nationally recognized awesome city!